TCM Movie Morlocks. Even though I think Body Doubles is something of a mess structurally I enjoyed it and find this discussion entertaining. Sark and Rick Discuss Brian De Palma's "Body Double"
This post is being republished as part of ClassicBecky's and Dorian'sThe Best Hitchcock Movies (That Hitchcock Never Made) blogathon. Click here to read other entries in the blogathon. Rick29: Sark, you once said that De Palma’s best Hitchcock homages were the ones where he took Hitchcockian themes and turned them on their head. I think Body Double is a great example of that. 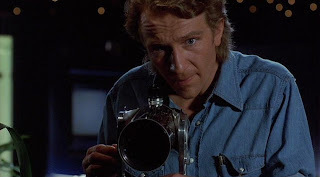 On the surface, Body Double is a suspense film--and a very good one. But underneath the surface, it's a witty film about acting and deception. When Jake freezes up while reliving the "sardine game" in his acting class, the teacher yells at him: "You've got to act!" That's just what everyone around Jake does throughout the rest of the movie. Alexander Revelle acts the role of Sam who, in turn, acts the role of "the Indian." Holly acts out of the role of Gloria. Even Jake gets in the game, acting out the role of an adult film producer. The scene over the closing credit is a perfect coda, where De Palma shows us a body double in a shower scene in the horror film. Holly, who is standing beside the lead actress, tells her: "I bet this will get you a lot of dates." Thus, more deception will be promulgated!